To buy Iron Bull Alpha Grips. Click the link below and use PROMO CODE "ND10" for 10% off at checkout! What do they say about their Product? The fastest, easiest and cheapest way to add muscle to your upper body is definitely through thick grip training. 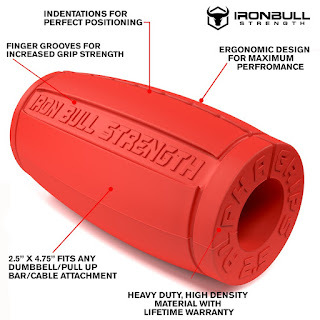 I have been using these Iron Bull Alpha Grips 2.5’s for a while. If you don’t know what they are, they are like a portable and affordable FATBAR. Coming off of hand surgery I thought these would be a great tool to add in my Training. Their primary purpose is to challenge the hand and forearm muscles more during pulling and curling movements, but they also improve hand comfort during heavy pushing movements and prevent active and passive insufficiency of the wrist and finger flexors during wrist curls and extensions. The 2.5’s are the middle of the pack in their Alpha Grips. They have 2.0’s, 2.5’s and monster 3.0’s. I have small hands so I knew right off the bat the 3.0’s were out. The 2.0’s would have been nice, but I thought I maybe I was a little more advanced for those. Man I didn’t know what I was getting into to. I had them on all the barbells, curl bars, pulldown, row and even the dip machine. What I found out was they are easy to snap on and easy to remove. The next day was Deadlifts and some Rows. Time to really see how these will work out. I started off with deadlifts. I snapped them on the bar and started warming up. Slapped 135lbs on and then 185lbs. I quickly had to use chalk to help hold my grip. These really showed me how weak my grip really was and what maybe was the reason for my hand injury! I followed up with one more set with them on. Then I ditched them for my heavy deadlift sets. They are easy to put on and take off of equipment, and once on they are very secure. Moving the alpha grips between different bars and handles takes only a few seconds, so if you rush between exercises for metabolic effect they won’t slow you down (this is key for a crossfitter when I am just lifting heavy to keep up the intensity) With my smaller hands these grips were challenging enough to grip to produce a considerable burn in my forearms. My thought’s so far. These Alpha Grips will humble even the biggest guy in the gym. BUT they will help you build the strength and grip needed so it does not become the limited factor on your lifts. I have been using these weekly and have made them a staple in my routine. I use them mainly on warm ups leading up to my heavy set. What makes these different than other Fatbar attachments? The biggest thing for me is the curved surface of the grip itself. It’s more form fitting to provide a more secure grip. I also found it easy on the wrist then a normal Fatbar. All the other grips I have seen have been straight flat surface. Iron Bull Strengths are the only ones I’ve seen like this. My Overall Rating: 10/10 for sure! The convenience, the burn, and the pump you get from these things are crazy and the results you get will show the effectiveness!